Lockheed Martin, the US government’s largest contractor, says it has made a technological breakthrough in nuclear fusion power. The breakthrough will apparently allow Lockheed to build a 100-megawatt “compact fusion reactor” (CFR) that can fit on the back of a truck within 10 years. The reduced size — just 10 feet by 7 feet — will allow Lockheed to “design, build, and test the CFR in less than a year.” Clean, limitless power — from a compact generator, no less! — could give us airplanes that can stay in the air forever, reliable power for developing nations, fresh water through cheap desalination, and much, much more. If Lockheed really has cracked fusion power generation, then almost every aspect of modern life could be in for a revolution. As for what Lockheed’s breakthrough actually is, the defense contractor is (unsurprisingly) coy. The official statement simply says that, “Our compact fusion concept combines several alternative magnetic confinement approaches, taking the best parts of each, and offers a 90 percent size reduction over previous concepts.” The rather flashy website and video that Lockheed created for Compact Fusion offers a few more hints, but it’s hard to separate fact from we-hope-it-will-soon-be-fact. I think it’s fairly clear that Lockheed doesn’t yet have a working fusion reactor, but rather it has stumbled across a technique that it hopes will allow for compact fusion generator. The compact fusion tech was developed by Lockheed Martin’s Skunk Works, the company’s secretive R&D division that previously worked on the SR-71 Blackbird, F-22 Raptor, and most recently the F-35 Lightning II and SR-72 scramjet spy plane. The group has “several patents pending” that cover the new approach to fusion. Lockheed has previously talked about “high beta fusion reactors, ” and the new device seen in the video appears to match Lockheed’s previous descriptions. Basically, this compact reactor is very similar to a standard magnetic confinement fusion reactor — but the chamber is cylindrical, rather than a toroid (doughnut) tokamak. From the scant details that we have, it sounds like a cylinder — plus some very strong magnetic fields — is a better solution for keeping the plasma at a high pressure and temperature. So far, the main problem with fusion is that it takes a huge amount of energy to start the reaction, and then we can’t keep the reaction going due to leakage. 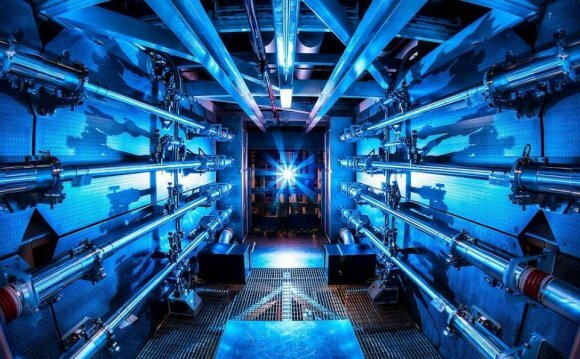 Seemingly, Lockheed believes this new approach will allow for a self-sustaining fusion reaction — and thus clean, limitless electricity. Historically, fusion reactors have been big, building-sized things — a lot like nuclear fission reactors, in fact. Lockheed says this new design can allow for designs that have a footprint as small as 10 feet by 7 feet (3m by 2m), and about 7 feet tall — or small enough to fit on the back of a truck. The small size means that prototypes can be built a lot faster, which is why Lockheed seems confident that it can test the CFR in “less than a year, ” and then iterate rapidly towards a prototype within five years, and a commercialized fusion reactor within 10 years. Due to the fantastic power density of nuclear fusion, these small reactors will apparently produce a constant 100 megawatts of power — or enough to power a large town. Lockheed is initially (within 10 years) targeting military applications, however, such as airplanes and large ships; an airplane with a CFR on board could stay in the air for years. Further down the line (20 years) Lockheed will look towards civilian uses of cheap, clean fusion power, such as providing reliable power to developing countries and desalination (which requires a lot of power). At some point, compact fusion power might also be considered for space travel. One of the biggest issues with space travel at the moment is that rocket engines require a lot of fuel, and it isn’t feasible to carry lots of fuel into space; the high energy density of a fusion power engine would make long-distance space travel — to Mars and beyond — much faster and more feasible.